Students: A second loss "too much to bear"
Research: Cancer research funds up in smoke? Technology: Think your car's secure? Just a semester away from Commencement, Linda Trinh, a talented biomedical engineering major intent on a career in cancer research, was found dead in her North Charles Street apartment, the victim of a homicide. She was 21. Baltimore Police told the university that evidence indicated Trinh's death was not an "absolute random" act of violence and that she may have known her killer. However, as of press time, an arrest had not yet been made. 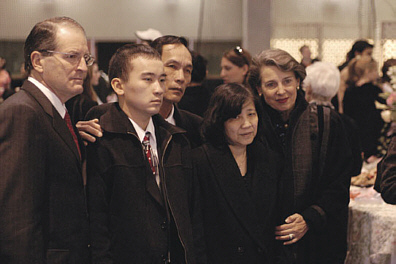 Linda Trinh's family with President and Mrs. Brody. "Today here at Hopkins, grief has us by the shoulders," Brody said at Trinh's memorial service. "Linda Trinh was a dedicated student who was determined to make a contribution to the health and welfare of others," Joseph Gitlin, an associate professor of radiology in the School of Medicine, said in his comments at Trinh's memorial service. The service was held on February 2 at Homewood's Ralph S. O'Connor Recreation Center. About 50 members of Trinh's family — including her parents, Quy Trinh and Hoan Ngo, and her brother, Quang — attended the service, along with more than 1,200 members of the Johns Hopkins community. Trinh, a native of Silver Spring, Maryland, was a past president of her sorority, Alpha Phi, and a former member of the university's women's volleyball team. She had worked as an assistant in Gitlin's lab for three years devising ways to use digital mammography to bring breast cancer screening to women in poor communities. Last spring, Trinh, whose parents are from Vietnam, was one of 16 engineering students selected for a Vredenburg Scholarship, which allowed her to travel to that country to study breast cancer detection and AIDS-related dementia. While there, she spent time with children at an AIDS hospice. Her interaction with them revealed much about the kind of person she was, Quang Trinh said. "She took them to the beach. She bought them lunch. She taught them English. While others remained distant, she didn't hesitate to show them the warmth and the love they had never received." At the service, friends and family spoke again and again of Trinh's love for others. "Once you met her you wanted to know her, love her, and protect her," said Sarah Hwang, A&S '04, one of Trinh's many friends. "Linda was beautiful," she said. "Linda was loving. Linda made a difference in my life." They also expressed the anguish they were feeling at the sudden loss of such a young, vibrant person. "Today here at Hopkins, grief has us by the shoulders," said Hopkins President William R. Brody. "It walks with us arm in arm. We would all wish to be free of grief, but to do so we would have to stop remembering Linda. And that we will not do." The memorial included Trinh's favorite song, "Beautiful" by Christina Aguilera; a stage draped with pink, her favorite color; and a reception featuring snack bars made with Special K with Berries, her favorite cereal. The volleyball team presented Trinh's family with her team jersey. Photo collages showed a smiling Trinh surrounded by friends and family. One display showed a five-year "Goal Map" that Trinh had created last year, outlining her dreams of going to Stanford Medical School and taking her family to the Vatican, dreams that will now go unfulfilled. Linda Trinh, center, with friends at an Alpha Phi party in spring 2003. Trinh's death marked the second time in nine months that a Hopkins undergraduate had been the victim of homicide. Junior Christopher Elser was murdered following a confrontation by an intruder in his Sigma Alpha Epsilon fraternity house on April 17, 2004. Second loss "too much to bear"
Less than three weeks after the death of senior Linda Trinh, Johns Hopkins University suffered the loss of another one of its undergraduates. Dominic Ferrara, a dean's list student in the Krieger School of Arts and Sciences, was found dead in his dormitory room in Wolman Hall on February 7. Police said Ferrara, who was 19, had apparently committed suicide. A native of Doylestown, Pennsylvania, Ferrara was remembered as an energetic, ambitious friend, classmate, brother, and son with a passion for writing and playing music. Some of Ferrara's compositions were played at his February 28 memorial service, held at the Homewood campus's Bunting- Meyerhoff Interfaith Center. "Dominic loved music, playing the guitar, computer games, swimming in the ocean, writing poetry, reading books, and philosophy," according to an obituary in his hometown newspaper, The Intelligencer. "He enjoyed spending time with his good friends and was devoted to his family, especially to his younger brothers and sisters." Ferrara was the oldest of five children. In a letter to students, faculty, and staff, Hopkins President William R. Brody said he was "pained deeply" by Ferrara's death. "At a time when we already stand in mourning for one life taken far too soon, we are asked somehow to cope with the loss of another," he wrote. "It is incomprehensible. It seems too much to bear." Brody encouraged members of the campus community and parents to find strength to bear the terrible news. "We must stand together, console each other, support each other, and most importantly, look out for each other." Two Hopkins professors have received the National Medal of Science, the nation's top scientific recognition. Neuroscientist Solomon H. Snyder and astrophysicist Riccardo Giacconi received their awards from President George W. Bush at a White House ceremony in March. "Sol's and Riccardo's careers — as scientists and as leaders of scientists — have been nothing short of extraordinary," Hopkins President William R. Brody says. Photo by Keith Weller Snyder advanced the field of neuroscience through the creation of a process to identify neurotransmitters — the messengers through which information is passed among neurons in the brain. He proved that in addition to the known amines, amino acids, and peptides, gasses can also act as messengers of information. 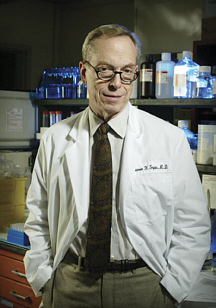 Snyder's neurotransmission research has contributed to the design of new psychiatric drugs and has sped up the screening of new candidate drugs. Photo by Will Kirk Giacconi, considered the father of X-ray astronomy, was a co-recipient of the 2002 Nobel Prize in physics. More than 40 years ago, he headed the team that discovered cosmic X-ray background, leading to a new understanding of black holes, neutron stars, galaxy clusters, and quasars, and the evolution of the universe. 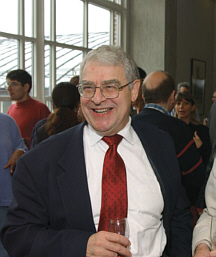 Giacconi also served from 1981 to 1992 as founding director of the Space Telescope Science Institute, headquarters for the Hubble Space Telescope on the Homewood campus. Giacconi "possesses profound insight, and his strategic understanding into where astronomy and astrophysics is going and the path, in fact, it should be taking is unmatched in the field," says Colin Norman, a physics and astronomy professor at Hopkins. Congress established the National Medal of Science in 1959 as a presidential award to be given to individuals "deserving of special recognition by reason of their outstanding contributions to knowledge in the physical, biological, mathematical, or engineering sciences." In 1980, Congress expanded the award to include the social and behavioral sciences. Each year, a committee of scientists and engineers, appointed by the president, evaluates the nominees based on the impact of their work on scientific thought, recognition by their peers, and their influence on education. 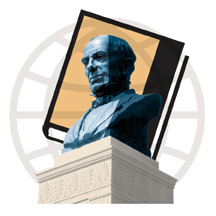 Snyder and Giacconi were among eight recipients of the 2003 award, announced in February of this year, and they are the seventh and eighth members of the Hopkins faculty to receive the award. Most people are familiar with the outward manifestations of someone shifting attention from what he sees to what he hears: Picture a driver swerving while talking on a cell phone. But scientists have not had much idea of what actually transpires in the brain when that happens. Steven Yantis, a professor of psychological and brain sciences in the Krieger School of Arts and Sciences, has discovered that when people shift attention from eyes to ears, there's a surprising amount of activity in a part of the brain called the frontoparietal network. Says Yantis, "One of the new, exciting results of this work is that the frontoparietal network, which had been thought of for visual-spatial shifts of attention, also applies to non-visual, non-spatial shifts." Yantis continues, "You can think of the senses as being information channels. You have control over the volume, and can allow some of them to have high volume while the others fall into the background. We're interested in how you do that, and how the brain changes as your state of perceptual activity changes." To study this, Yantis and his co-investigator, Sarah Shomstein of Carnegie Mellon University, used functional magnetic resonance imaging (fMRI) to watch neural activity in test subjects. The subjects, placed in an fMRI scanner at Hopkins' Kennedy Krieger Institute, wore headphones and watched a computer monitor. The monitor displayed five streams of letters that were arranged in a cluster and changed four times per second. Through the headphones, subjects heard three voices — female voices on the left and right, and a male voice in the center — speaking letters. The researchers told the subjects to concentrate on either the central stream of letters on the monitor, or on the male voice through the headphones. Periodically, the subjects would see or hear a numeral instead of a letter, and had to press a button when this occurred. Furthermore, if the numeral was 4, they were to maintain their attention on whichever stream they were concentrating on. But if the numeral was 2, they were to shift attention to the other stream. That is, if a subject was concentrating visually and saw a "2," he would switch his attention to what he heard through the headphones and keep his attention there until he heard another "2," whereupon he would switch back to the visual. The scanner created images of brain activity, revealing unexpected activity in the frontoparietal network each time a subject shifted attention. By showing that activity in the visual parts of the brain decreased when attention was directed to sound, the experiment also displayed a neural basis for the behavioral evidence that shifting attention to some auditory stimulus (think of that driver's cell phone) can impair detection of important visual events. "Ultimately," says Yantis, "what we're trying to understand are the executive control functions of the brain. Life consists of a series of tasks in a hierarchy. Each subtask consists of selective attention, choosing from all the sensory input, identifying that input, then making a decision about what kind of actions it affords." When Maryland passed its Cigarette Restitution Fund (CRF) bill in 2000, legislators hoped that good things would come of it. Using its share of the 1998 national Master Tobacco Settlement Agreement, which required cigarette manufacturers to pay $206 billion to the states over 25 years, Maryland poured millions of dollars into smoking-cessation programs; tobacco crop conversion assistance for farmers; and cancer screening, treatment, and research. Illustration by Scott Roberts Since then, Maryland, which in the early 1990s was fifth in the nation for cancer deaths, now ranks 16th, due to declines in cancers targeted by the initiative. In fact, mortality rates in Maryland are dropping at double the rate of the rest of the nation. "The CRF program over the last five years has accelerated a lot of the screening efforts, in colorectal cancer, prostate cancer, and a number of other cancers," says John Groopman, chairman of the Bloomberg School of Public Health's Environmental Health Sciences Department and co-director of the CRF program at Hopkins (with Martin Abeloff, director of oncology at the School of Medicine). "These are all things that are contributing — not only now but in the future — to a declining rate of mortality." A simple blood test based on genetic "red flags" may be able to identify patients with an above-average risk for a common colon cancer. There are mutations in six genes that prevent the normal turning off of tumor growth in colon cancers. The next step is to find drugs that might block the proteins responsible for speeding up cellular processes. Certain genes turn off in some people, leading to drug resistance. Identifying these genes will help scientists understand what is limiting the effectiveness of current cancer therapies. There is a "master gene" in mice that controls 50 other genes that protect the lungs from pollutants. The master gene turns on in response to pollutants such as smoke, which in turn activates detoxifying genes that protect the lungs from emphysema. Software for handheld devices will allow community health workers to identify subjects' at-risk cancer behaviors on-site — and immediately provide advice. A new tool uses a molecular "magnet" that can find a DNA mutation among thousands of cells. The test may detect microscopic cancer in its early stages. Unfortunately, faced with a state law requiring a balanced budget, a decrease in state revenues, and spiraling Medicaid and K-12 education costs, Governor Robert L. Ehrlich Jr. has proposed major cuts to CRF funding. His 2006 budget proposes cutting Hopkins' funds to half of the $2.4 million the institution received for 2005, and the final numbers may be worse than that. A cut in the CRF budget would come out of Hopkins' Cancer Research Grant. That decision has supporters of the research lobbying hard in Annapolis, trying to keep at least the half the governor has allocated. 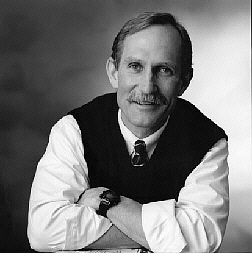 After 24 years, an MD, and a Nobel Prize, Peter Agre, Med '74, is leaving the Johns Hopkins School of Medicine to become vice chancellor of science and technology at Duke University's Medical Center. "This has nothing to do with basketball," jokes Agre. "I feel I can have a bigger impact there than here. Duke is terrific, but they are a lot younger than we are. They have areas where they can improve and they know that. I'll be preaching the Hopkins gospel to a very excellent, but still-up-and-coming institution." Photo by Keith Weller Agre, an internist and professor of biological chemistry, won the 2003 Nobel Prize in chemistry for discovering aquaporins, the proteins that form the channels that transport water through cell membranes. His was the first Nobel awarded to a current Hopkins School of Medicine faculty member in a quarter of a century. In his new role, Agre will work to boost Duke's basic science efforts, help steer some of the graduate programs, and serve in some of the recruiting efforts in the medical sciences. Agre will head a research lab of two to six people who will be looking at clinical topics such as aquaporins' involvement in malaria, osteoporosis, and in the body's defense against starvation. Agre, 56, says he's looking forward to the new job, which starts July 1. "I've been [at Hopkins] so long I feel kind of typecast. I've given Hopkins my best years, and now I'm feeling the need to reassert myself in a new setting where I can actually take charge. I hope I can make a difference and contribute in a significant way." 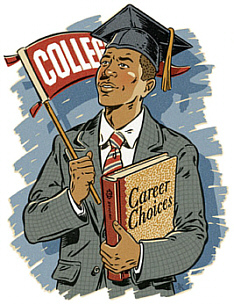 Illustration by John Kachilk The Academy for College and Career Exploration (ACCE) is not your typical Baltimore City public high school. For starters, it's small. In fact, the school, which opened its doors to freshmen last September, has only 150 students (and, at full capacity, will only have 400 in grades 9-12). Then there's the schedule: ACCE students keep "professional" hours, attending school weekdays from 9 a.m. to 5 p.m. year-round. Most importantly, there's the school's distinctive educational philosophy, which blends standards-based curricula with "real world" experiences to promote individualized, competency-based instruction. ACCE's mission is to help students develop a love of learning, a constructive direction for their lives, and confidence in their own abilities to succeed. "None of the traditional labels really apply to this school," says principal Chris Ndeki Maher, former director of education for Baltimore-based Advocates for Children and Youth. "We're not a charter school, we're a public school. We're citywide, but we don't have an entrance exam." ACCE, which is sponsored by the Johns Hopkins University Institute for Policy Studies (IPS) in partnership with the Mayor's Office of Employment Development, is one of four "innovation high schools" that have been created in Baltimore. (Hopkins' Center for Social Organization of Schools is involved in another innovation high school, the Baltimore Talent Development High School, which opened last fall.) The small, independent high schools were founded with a $20 million grant from the Bill and Melinda Gates Foundation. IPS was involved in writing ACCE's implementation grant, developing curriculum, and selecting faculty. Four staffers at IPS continue to work with the Mayor's Office in running the school, doing everything from troubleshooting transportation issues to developing classroom management techniques. "The school system has failed in a lot of areas," says ACCE teacher James Campbell. "A lot of students are not prepared to go in the directions they want to go in. ACCE's challenge is not just to help them get a high school degree but to be able to give them more focus. We want them to go to college with a foundation for what they want to do." In addition to their standard English and math courses, ACCE students are required to take Campbell's "21st Century Careers" class. In it, they research career choices — everything from forensic science to pediatrics — so that they can understand what the world holds beyond high school and how to get there. "My desire is to serve as a facilitator and to point them in a direction where they can get this information," he says. Crafting a new school from scratch that's unlike any other in the school system hasn't been easy, administrators admit. Students from another school housed in the same building as ACCE disrupted much of the fall semester by setting fires, Maher says. The school never got on the city's dedicated bus service list, so some students had to wait 90 minutes for buses to get to and from the Northern Parkway site. And in January, some of the pipes burst and caused flooding. Despite the hardships, however, administrators think they are on the right track. "It's very early in the game, but we are very optimistic," says Marion Pines, a senior fellow at IPS who has been closely involved with ACCE from the beginning. Pines, who directs the institute's Sar Levitan Center, is known for her innovative strategies and programs to help youth who have dropped out of high school reconnect with education and employment opportunities. Pines' and IPS' interest in developing ACCE grew out of this focus. "We wanted to see if we could take what we've learned with working on programs that help with disconnected youth and see if we can prevent them dropping out in the first place," she says. So far, IPS and ACCE staff say they are pleased with the results. "Students are getting individualized attention and the kind of career and college exposure they wouldn't get otherwise," Pines says. "Every teacher knows every single student by name. It's a very healthy, strong environment." Maher says he has students who want to stay after school to work on their math homework. "We have kids sometimes getting in trouble for reading in class," he says. Hopkins women's basketball achieved a third straight season of 20-plus wins, as the team advanced to the semifinals of the Centennial Conference tournament before falling to eventual champion McDaniel College. The Jays finished 21-5 and placed two players on the all-conference team. Photo by Will Kirk Coach Nancy Funk described her team as young, fast, and inconsistent. Three seniors — Ashanna Randall, Ashley Felix, and Alissa Burkholder — formed the core of the starting lineup. But the squad had six sophomores and two freshmen, and lost one of its juniors midway through the season when forward Amanda Leese took an opportunity to study abroad. The Jays rolled to an early record of 13-2, but they came back from holiday break flat. Back-to-back losses in January seemed to wake the Jays up, and they finished the regular season with eight straight victories, including a dramatic, double-overtime win over McDaniel, 81-80. Two weeks later, the Green Terror exacted revenge by ending the Jays' season in the conference tournament, 72-59. Captains Randall and Felix earned all-conference honors, and Randall became the 11th player in Hopkins women's basketball history to score 1,000 career points. What if Thurgood Marshall had been white? What about Louis Armstrong, or for that matter, Johns Hopkins pediatric neurosurgeon Ben Carson? Surely their intellect and talent would have propelled them to accomplish great things no matter what their race, but how different would the world be if they had been born white instead of black? The role that race plays in achievement is not often addressed — maybe because it makes people uncomfortable — but at Hopkins, some inspired volunteers and students are exploring that super-sensitive question. Through student-led independent research, the History of African Americans@Johns Hopkins University project is at once documenting the contributions of African Americans to Hopkins and distilling from them a larger sense of the importance of African-American culture and experience to society. The project grew out of discussions between MSE librarian Sharon Morris and her husband, John, after library assistant Joyce Mason sought Sharon's advice on how to observe Black History Month in the library. John Morris, a civil lawyer specializing in public policy (who is unaffiliated with Hopkins), was intensely interested in the University of Michigan affirmative action cases brought before the Supreme Court in 2003. Working off the notion that such policies are justified in part because black students bring something different to a university than do other students, the Morrises thought it worthwhile to try to distill what the "something" was. "We don't tend to ask the question, so we don't know the answer," says John Morris. As part of the History of African Americans@Hopkins, one student researched the Black Student Union. 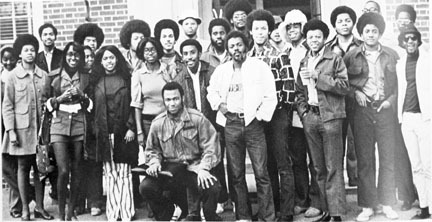 This is the BSU of 1972, four years after its founding. Sharon Morris and Mason proposed that students conduct research through for-credit independent study projects, each study tackling a different piece of African Americans' history at Hopkins. Students develop their research topics with the help of a faculty adviser and participating librarians. If they need suggestions, a committee of faculty members, librarians, and black alumni has a long list of historic topics, events, and people worthy of further research. Completed research projects will be online ( afam.nts.jhu.edu) for public access. Claudette Onyelobi, a junior premedical student from Chicago, had never heard of Roland Thomas Smoot, the first black doctor at Hopkins to gain admitting privileges. When project organizers told her his contributions to the university were largely undocumented, she agreed to take on an independent study about him. "It turned out to be magical," Onyelobi says of the research she finished last summer. She found almost no written history of him, but through the course of eight interviews with Smoot (more than 100 pages of transcribed material), Onyelobi came to know this humble but hugely successful physician. At the end of every interview, Onyelobi says, Smoot would wait until she turned off her tape recorder. Then he would dispense career advice, ask about her studies, or encourage her to lead with modesty, always with an eye toward helping others. "Bring up others behind you," Smoot told Onyelobi. He also offered her this piece of advice with respect to race: "Everybody that's black ain't your friend, and everybody white ain't your enemy." Onyelobi is grateful for the confidence and inspiration she found in Smoot. But her greatest reward from the research is knowing her work helps document Smoot's role in removing racial barriers in American medicine. "I was really happy to be able to put that down for people to read in the future," she says. Other students — a few each spring since 2003 — have done research on Levi Watkins, Hopkins' first black chief resident in cardiac surgery (and today associate dean of the medical school); Franklin Knight, the Leonard and Helen R. Stulman Professor of History in the Krieger School of Arts and Sciences; and the founding of the Black Student Union in 1968. As the subject of a research project, Knight, who has taught at Hopkins for 32 years, reflected on his contributions to the university and remembered early obstacles. He recalled the real estate agent who told him he couldn't live in certain parts of Baltimore. He also told the story of a student he'd flunked whose mother then protested to the dean, saying that when she was a student here, Hopkins didn't hire "people like me," Knight says. U.S. Navy Photo by Photographers Mate 2nd Class Laurie L. Wood "This warship bears the name of a true American hero. We honor his memory here today. 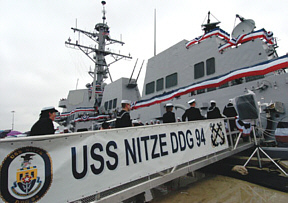 Welcome, Nitze, to the U.S. Atlantic Fleet." —Rear Adm. Michael Nowakowski, commander of the fleet's Naval Surface Force, speaking at the commissioning ceremony for the USS Nitze, the Navy's most advanced guided-missile destroyer to date. The ship was named for Paul H. Nitze, former secretary of the Navy and co-founder of Hopkins' School of Advanced International Studies, who died last fall. The vessel, which is more than 500 feet long and weighs 9,300 tons, houses a crew of 300. It has an AEGIS weapons system and an MK 41 Vertical Launch System that can fire up to 96 surface-to-air and Tomahawk missiles, as well as vertically launched ASROC torpedoes. The ceremony was held at Naval Station Norfolk, Virginia, on March 5. More than 150 million car keys talk to their cars. Slide one into the ignition and turn it, and it has a lightning-fast electronic conversation with the car to verify that it's the authorized key. The vehicle literally asks the key a question, and if the key doesn't answer correctly, the car assumes someone is trying to steal it and the engine will not start. Texas Instruments, the manufacturer of the keys, describes them as the most effective automotive security measure on the market. The company was confident that its technology, also found in the 6 million SpeedPass tags used for purchase of gasoline at Exxon and Mobil stations, could not be circumvented. That was before three Hopkins graduate students in computer science decided to look it over. 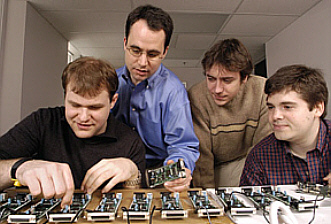 Avi Rubin (second from left) supervised a team of computer science graduate students who put "SpeedPass" security to the test. It failed. The students, from left, are Adam Stubblefield, Steve Bono and Matt Green. The three — Steve Bono, Matthew Green, and Adam Stubblefield — spent months reverse-engineering the keys, which are known as RFID devices (for Radio-Frequency IDentification). They figured out how to clone RFID keys and start cars that were no longer secure. They also cloned a colleague's SpeedPass tag and, with his knowledge, bought gas on his account. Says Green, "We told them [Texas Instruments] that if we could do this, anybody could do this." In partnership with RSA Laboratory, the students worked under the direction of Avi Rubin, technical director of the Johns Hopkins Information Security Institute. They decided to examine the technology because use of the devices is widespread and increasing. A car key equipped with RFID contains a microchip and a tiny transponder. When a driver inserts the key in his car's ignition, the transponder receives a random number transmitted by a reader device in the car's steering column. The key's microchip encrypts the number, using a 40-bit cipher key, and generates a unique identifier number that is transmitted back to the reader. The car will not start unless it receives the correct identifier. First, the researchers had to figure out the encryption algorithm used by the microchip to generate the identifier. They searched the Internet and found an archived presentation by a Texas Instruments engineer in Germany. Says Green, "It had this very, very incomplete diagram of what the cipher looked like. It didn't have all the details we'd need, but it gave us a push in the right direction." Equipped with the diagram and some other found documentation, the Hopkins team learned enough to take samples of the RFID devices and begin transmitting carefully chosen electronic queries to them. The researchers noted how the devices responded each time, which gave them clues as to what was happening inside the microchip. After about three months' work, Green says, "we were able to recover the complete cipher design, everything we needed to write a program that would do the encryption." Once they had this, they could crack the cipher keys in an RFID-equipped car key or SpeedPass tag and clone it. Texas Instruments sent five RFID tags and challenged the team to crack their ciphers. It took the students less than two hours. Next, the Hopkins team assembled about $1,000 worth of technology to create a simulator that would mimic the RFID device in a car key. After cracking the cipher in a real key, the researchers used the simulator to fool a 2005 Ford Escape into starting its engine, witnessed by a reporter from The New York Times, which broke the story. Texas Instruments concedes that the Hopkins team has cracked the security system, but argues that to steal an RFID-equipped car, thieves would somehow have to "read" the victim's key to create a clone. But Bono, Green, and Stubblefield demonstrated a device that read an RFID key in one of their pockets. All they had to do was sit next to the victim, or stand next to him in an elevator. Two years ago, Hopkins' Department of Chemical Engineering took note of the expanding professional opportunities for biomolecular engineers. It added "biomolecular" to its name and new courses to its curriculum. Chairman Michael Betenbaugh thought the changes might double the number of majors in the department. Instead, enrollment has quintupled, from 19 freshmen in fall 2001 to 99 freshmen in fall 2004. Says Betenbaugh, "We went from a small program in engineering to one of the largest programs on campus." While chemical engineers design and operate chemical processes, biomolecular engineers apply that work to biology, for example, in the design of complex biomolecules such as pharmaceuticals. "Students are pretty smart, and they're figuring out that chemical engineering is going more bio. And if you want to go bio, this is an appropriate way to go," says Joseph L. Katz, a professor in the department. "Biomedical engineering is good training for medical school, but there isn't very much of a market, as far as I know, for B.S. or M.S. biomedical engineers. There is a market for B.S. and M.S. biomolecular engineers." Most notably, new grads are a hot commodity in the pharmaceutical industry.